Our new offices at 405 Linden are the result of extensive rehabilitation of a 1903 wood-framed house. We removed decades worth of low drop-ceilings, bad wallpaper, and aging lath to uncover the building's still-sturdy (if crooked) bones, reinforced the roof and floor structure, and provided updated accessibility and mechanical services. 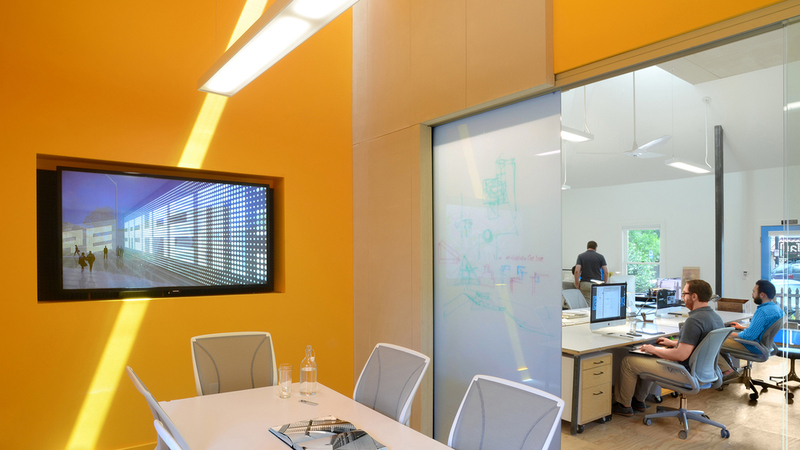 Two skylights provide a trace of original chimneys and improve daylighting, acoustic treatment wraps up the walls and allows us to pin-up drawings, and a bright orange conference room gives us some private meeting space. All-LED lighting, a NEST thermostat, and a BigAss fan work together to reduce our energy consumption, and a low-flow toilet, faucets, and shower conserve water while allowing the runners in the office to get some exercise at lunch. The exterior and landscaping are still being renovated, but for now, we're excited to have a semi-permanent home! Feel free to come visit us.